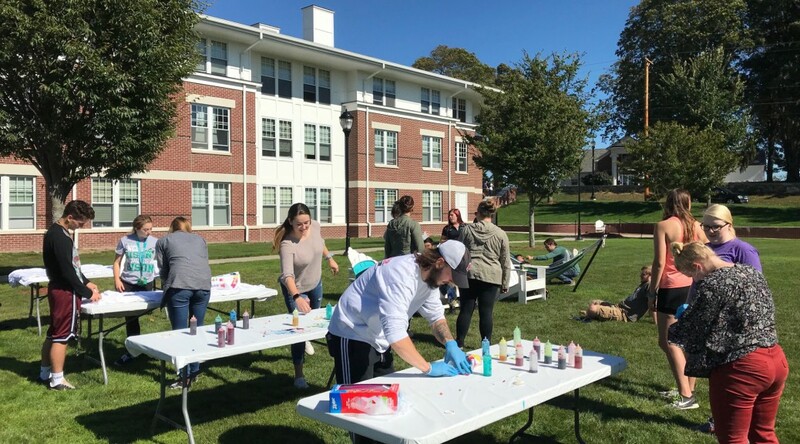 Nichols College students tie-dye T-shirts Oct. 4, 2017, as part of the College’s “Wicked Wednesday” social program. Cześć from Poland, Nichols College Bison! 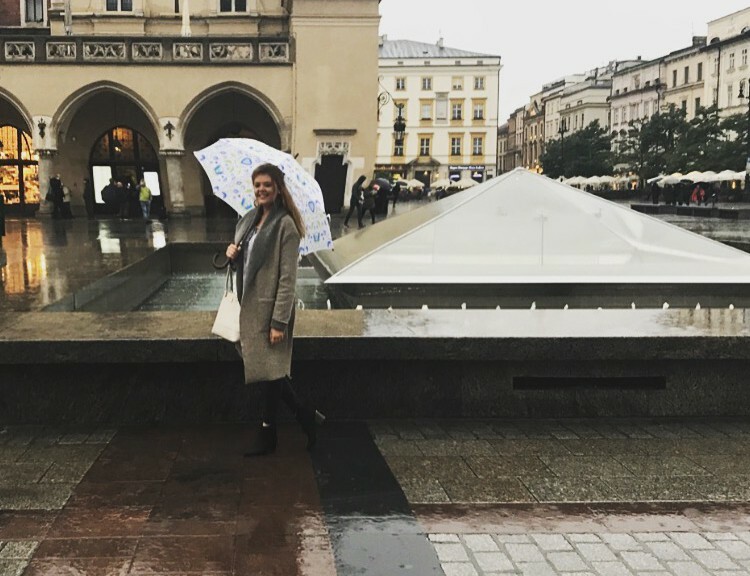 This week was my first full week here studying abroad in Krakow, Poland, and I have already fallen in love with the city. Krakow has welcomed me with open arms, and I feel at home. I have had the opportunity thus far to explore the city and its beauty. I have eaten at some of the most traditional and historic Polish restaurants and have found little coffee shops and bars that make Krakow so unique. It is almost impossible to describe how special and beautiful Poland is. There is something about it here—it feels like it would be almost impossible to leave. And even after settling in, it doesn’t feel real. By far, my favorite place to go in the city is a café in the Rynek market square called Café Bar Magia. This is a cute little café that has a courtyard garden in the center of it. Luckily for me, I live right outside the city center, so this little place and everything else is right around the corner for me! The city center is one of the things that Krakow is most known for. It has restaurants, cafes, shops, churches, bars and so much more scattered throughout a huge square. There is a variety of farmers markets, festivals, and horse carriage rides every day of the week. It makes living here feel like living in a village out of a movie or story book. This past week, aside from trying to navigate around town, I have started my Polish language studies at Jagiellonian University. I will be taking an intensive, two-week Polish language course before my regular classes begin. Attempting to learn the language is by far one of the most difficult things I have had to do, but Polish is a beautiful language so by the time December comes around, I hope to have a general understanding of it. Language is such a huge part of the culture here in Poland, and it is something I am determined to learn. Another important part of the Polish culture is food and soccer. Stay tuned, because next time you hear from me, I will be digging into different types of Polish foods and will be sharing my experience at a soccer game here in Poland. Jenna McAssey is a junior at Nichols College and an intern for the College’s Office of Marketing and Communications. She is spending this semester studying abroad in Poland. On Oct. 1, 2017, police in Las Vegas responded to multiple shots fired at the Harvest Festival across from the Mandalay Bay hotel. The identified shooter, 64-year-old Stephen Paddock of Mesquite, Nev., killed 58 and injured over 500 people who were watching country music singer Jason Aldean perform. This was the worst mass shooting in modern U.S. history. 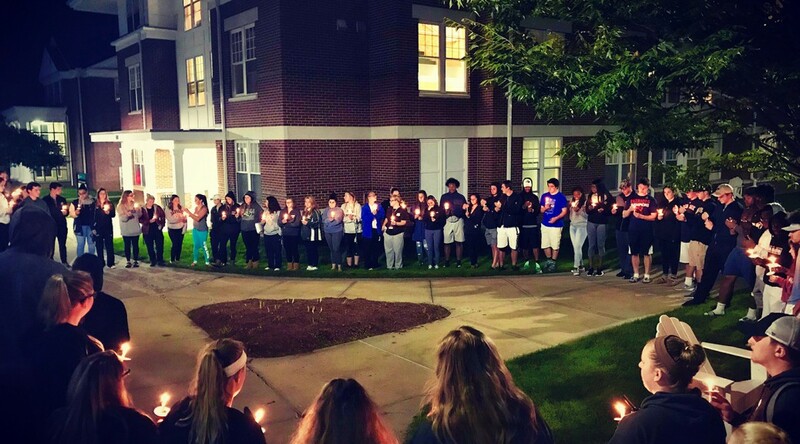 To show our respect to these victims and everyone affected by this terrorizing incident, Nichols College held a Candlelight Vigil Oct. 3, 2017 at 9:30 p.m., on the Copper Beech Quad. As it was my first candlelight vigil, I wanted to get there a few minutes early to check out the scene. As I arrived at approximately 9:20 p.m., a handful of students were gathered near the brick wall outside Copper 1, most of whom were members of the Student Government Association (SGA), which ran the event. Initially, I thought that these 13 people (including me) were going to be the only ones to show up. I thought maybe everyone was doing homework all cuddled up in their beds. Right when 9:30 p.m. hit, however, a swarm of people from all directions started to arrive. Seeing this crowd of fellow students gave me chills—the good kind of chills. 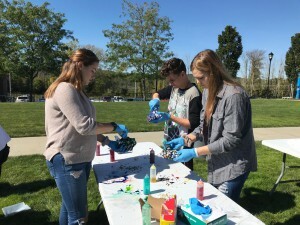 From first-year students to seniors, there were about 100 people on hand to pay their respects to the victims of the Las Vegas shooting. The air was filled with hope as more and more people were getting their candles prepared for the vigil. Once, everyone was ready, we formed a circle where we passed the lights from our candle to the person next to us; there was absolute silence. As all the candles were lit, SGA President Catherine Hoey, a senior, announced that if anyone wanted to say anything about how they feel about the incident to say it now. Immediately after she said this, though, the sprinklers went off and got a good part of our circle wet. This lightened the mood before we started to seriously talk about what happened. I thought that was great because as I looked around the circle, I could see the concern and somewhat nervous looks on the students’ faces. Khachikian’s story made the vigil more real in the sense that someone in our Nichols College community was affected by this incident. 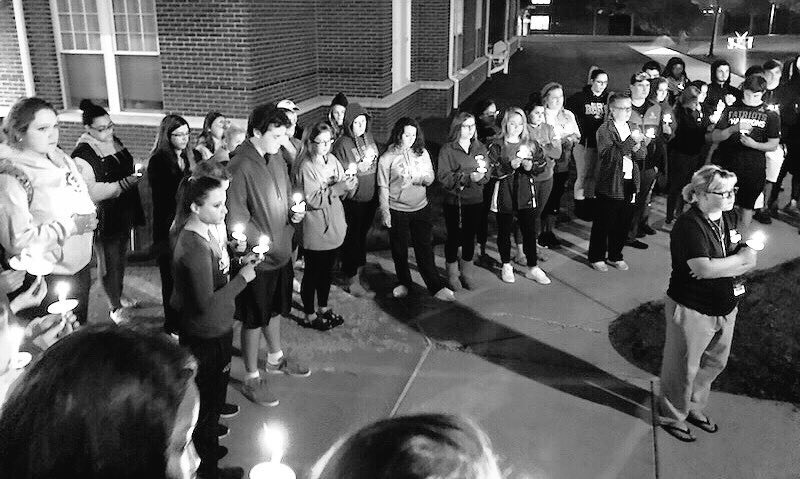 You just never know what people go through, which is why vigils like this are crucial in showing our love and support. After a moment of silence, Hoey thanked everyone for coming out, and everyone dispersed back to what they stopped doing to attend the vigil. Megan Nathanson, a sophomore sports management major, shared her thoughts about the vigil with me. “Everyone was on the same page in that we all need to unite together, appreciate those who are in our lives, and never take a day for granted,” she said. “I attended because I wanted to show my support for those who lost their lives and those who survived. Lives are now changed forever because of this terrible incident. Ashley Dallaire is a senior marketing major at Nichols College and an intern in the College’s Office of Marketing and Communications.